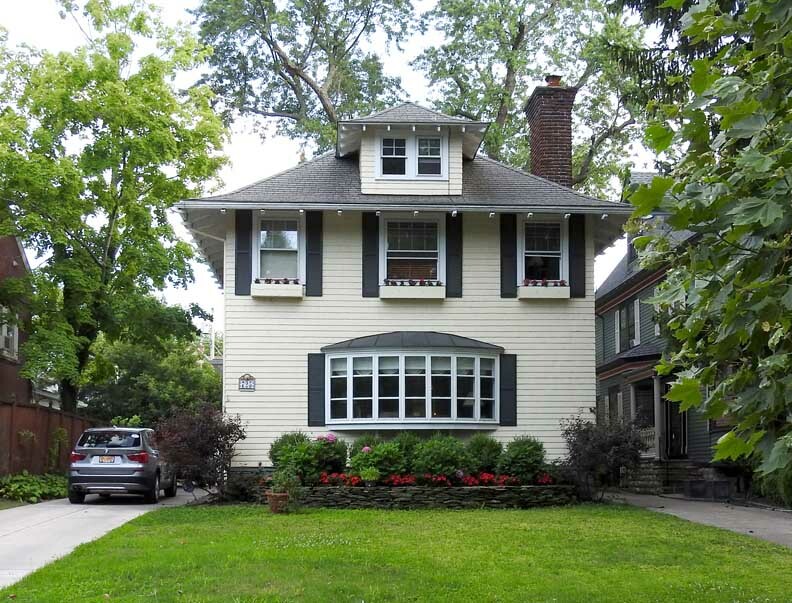 2 1⁄2-story hipped roof frame house with Craftsman and Colonial Revival styling. Stone foundation, wood shingle siding, asphalt roof. Side entry with hipped hood. 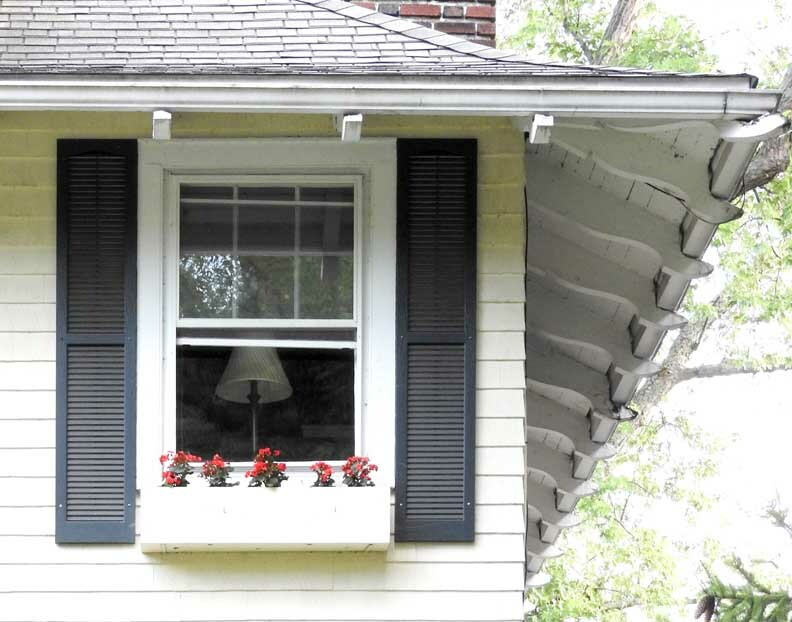 Front bow window 8/1 and 6/1 double hung wood window elsewhere. 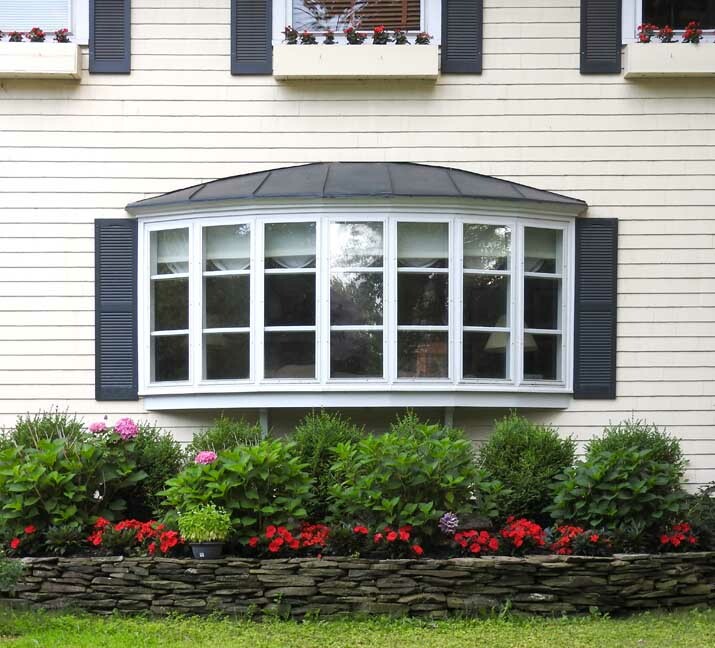 Hipped dormer with paired windows. Open eaves with exposed rafter tails. Contains contributing hipped frame secondary building (garage). Built in approximately 1907, this two-and-a-half story hipped roof frame house was built with craftsman and colonial revival styling. 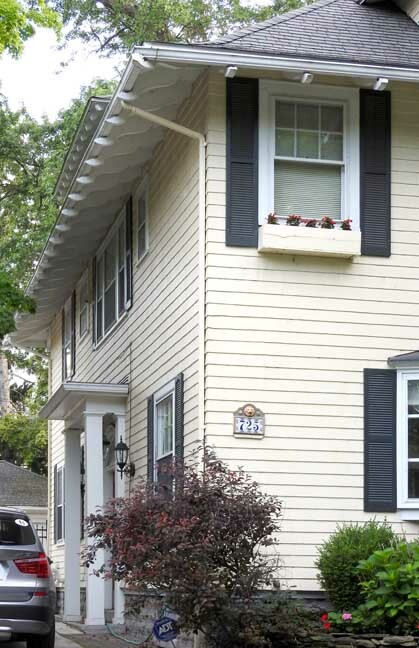 It has a side front entrance with hipped hood, so the front of the house faces the side, not the street. Many side-entrance colonials were built in that era, presumably to enable colonial style homes to fit onto narrower lots. 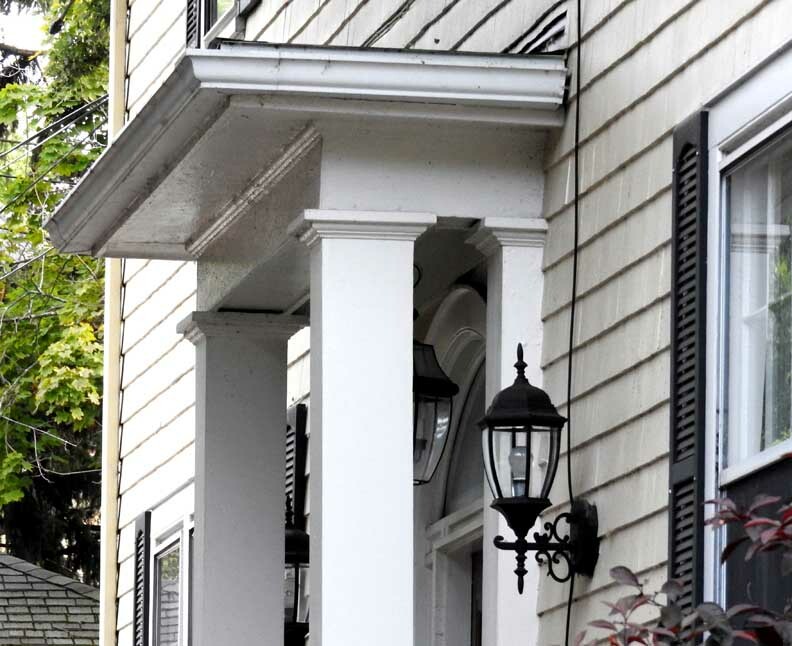 It was originally built with a porch on the side facing the street, which in about 1962 was replaced with a bow window. 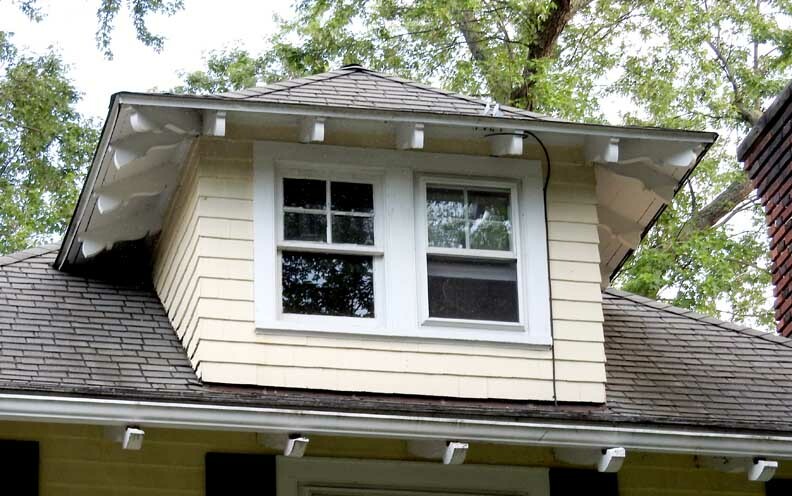 It has a hipped dormer with paired windows and open eaves with exposed rafter tails. The home was owned by the Feist family for 33 years, from 1909 to 1942. Joseph J. Feist ran the family business founded by his father, John Feist a civil war veteran with the Army of Tennessee. The family business, John Feist & Sons, was a planing mill providing construction materials for many of the houses built in Buffalo in the early part of the 20th Century. One of the Feists’ sons, Louis, was an outstanding athlete who played baseball with Lou Gerhig at Columbia University. In 1926 he was a member of Buffalo’s first professional football team, the Buffalo Rangers (also called the Bison Rangers). The house was owned by the Krivian family for 18 years, from 1944 to 1962. Arthur Krivian was a Harvard-trained chemist serving in the Chemical Warfare Services in WWII in the New York Ordnance Works near Syracuse. He became a manager in the Buffalo plant of the National Aninine Division of Allied Chemical Co.